One of the best ways to experience a place is to visit its markets. 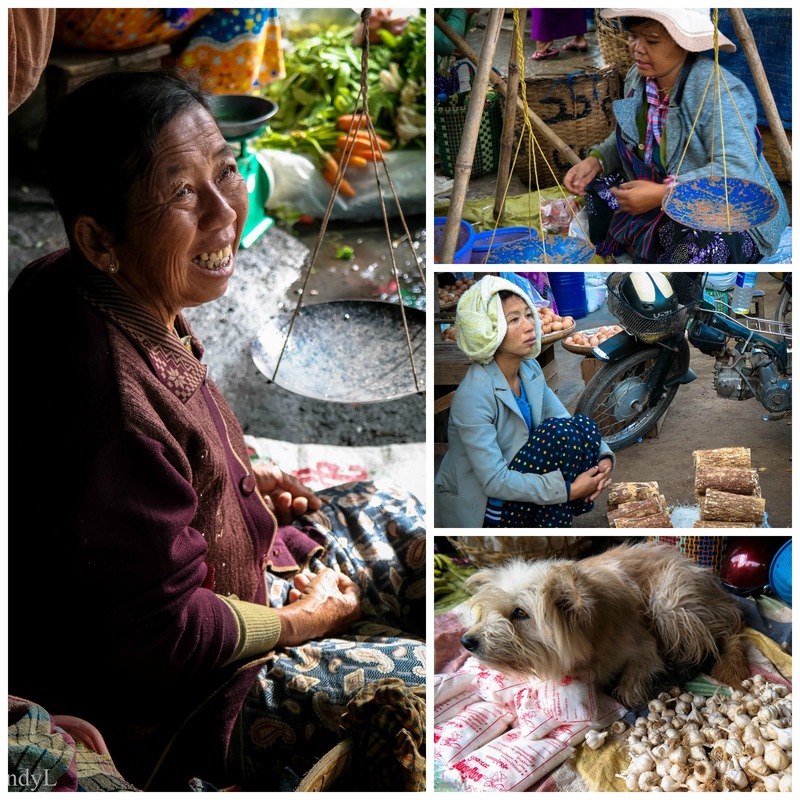 In Bagan, which is relatively large, the market is open every day and is a bustling hive of activity and traffic. 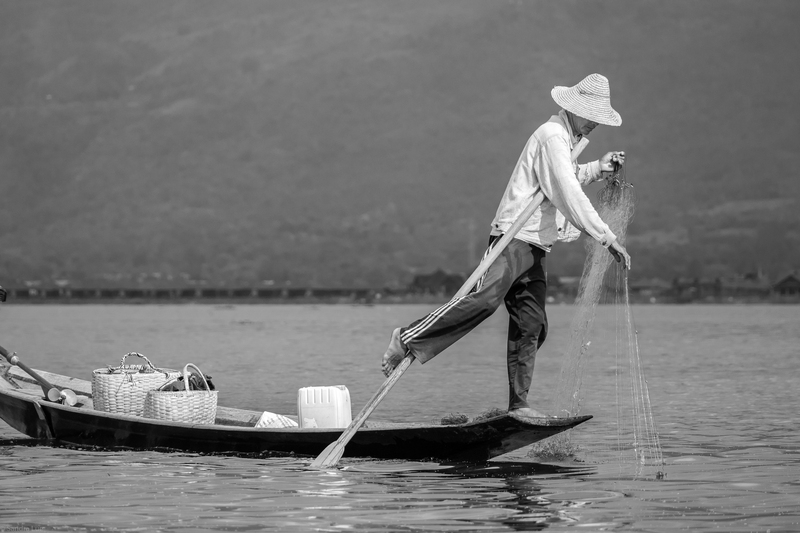 In the Inle Lake area, the market rotates through different towns by day of week. For both, vendors arrive at dawn to setup stalls of fruits, vegetables, meat, fresh and dried fish, cooked food, thanaka wood, woven bamboo walls, books, baskets … you name it. By early morning the centers are packed with people. Markets offer a sensory delight in visuals and aromas with more than few surprises. … and no, the shaggy dog was not for sale. 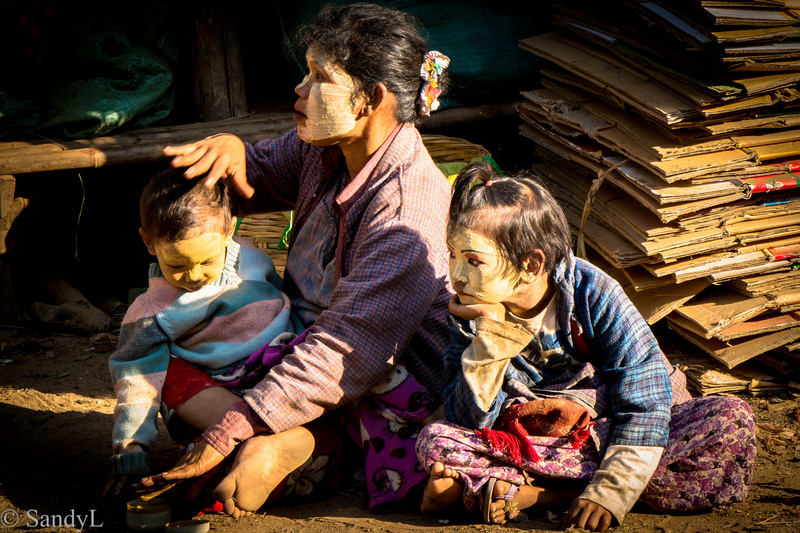 In the scene below, a mother was busy covering her children’s faces with yellow paste. This is thanaka, a traditional Burmese cosmetic made from the ground bark of the thanaka tree. The paste is typically applied to the face and acts as a cooling agent, anti-fungal cream and sun screen. Normally, it’s applied in light circles around the cheeks, eyes and nose. In this case, the mother’s applied it liberally with a very heavy hand. Something her daughter seems resigned to accept. While wandering through Nyaungshwe market, we came to a wall of shuttered stalls. At first we weren’t sure what they were but as we waited an elderly man came along and opened one of the doors. Inside he uncovered an ancient barber shop chair. It was so old that the wood was bleached through and the metal rusted white. The seat had been re-covered in yellow tarp, but the solidness of the wooden arms and embossed metal base spoke of vintage quality. With methodical care and pride, he wiped down the chair. Minutes later he was open of business. Whenever I travel I take lots of pictures. After the trip, it takes me a while to sift through them all. I discard the (many!) uninteresting and bad shots; select the context and story shots and choose the ones that I just plain like. I always prefer pictures with people in them. Inevitably my favorites are portraits. For me, the sense of place is best captured in the expressions and character of its people. 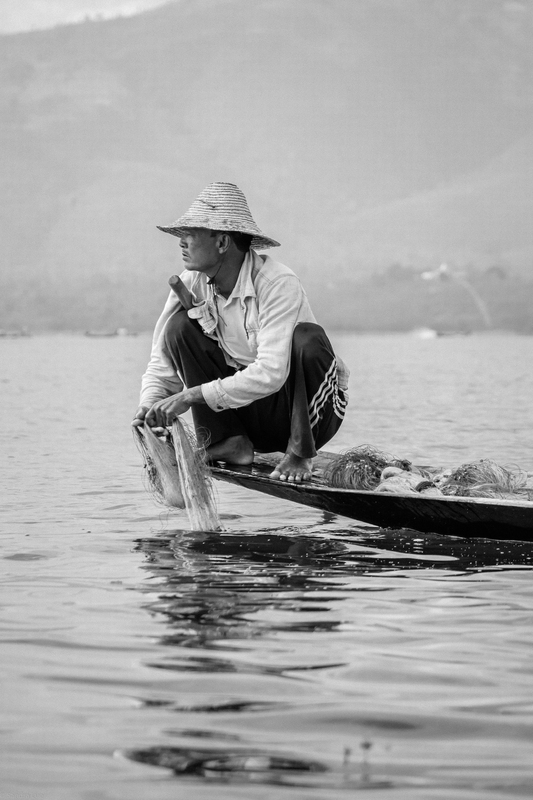 Here are a few from my trip to Myanmar. For whatever reason, I almost never take pictures of children and cats. Don’t get me wrong, I love children and cats. Some of my favorite people were children once. Cats even. But as photo ops? Not so much. Except for this one. 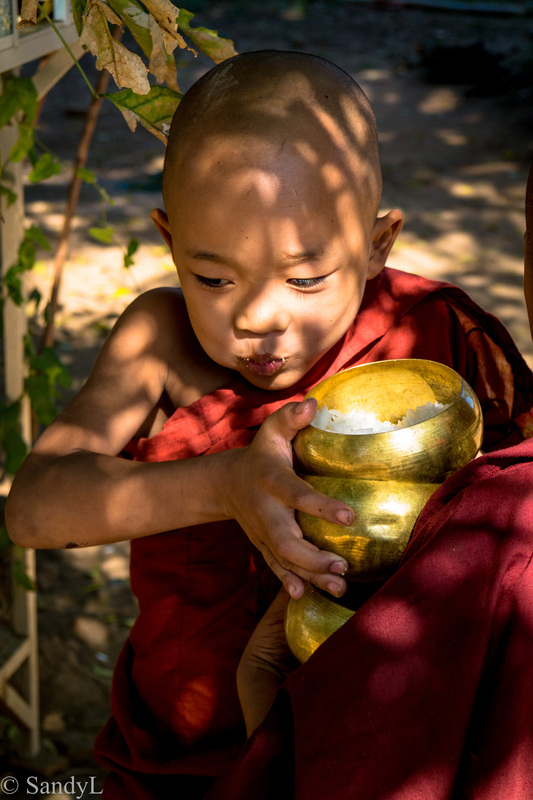 This little monk had just gobbled up a special treat. He’d claimed a small cake included with the rice in the daily alms collection. I love the expression on his face and the overall delight in his posture. My absolute favorite portrait from Myanmar? That would be of the Cheroot smoker. It was taken on our first day in Bagan. We’d visited the early morning market and she was setup right at entrance. Over the next eight days I took hundreds of photos but this one, taken in the first hour, is my favorite.